Tropical cyclones can develop in the Gulf of Mexico, the Caribbean Sea, the Pacific and Atlantic Oceans. They are born in moist tropical air. About every four to five days, a tropical wave of low pressure moves along with westerly winds. Some of these waves develop into tropical depressions, tropical storms, and hurricanes. Typically, an “eye” forms when the tropical cyclone reaches hurricane strength, but an eye is not necessary for a tropical cyclone to become a hurricane. Another way to think of a hurricane is as a large heat engine. The fuel is moisture from warm ocean water. The moisture is converted to heat in the thunderstorms that form. Spiral rain bands that surround the tropical cyclone’s core help feed the circulation more heat energy. As air nears the center, it rises rapidly and condenses into clouds and rain. The condensation releases tremendous amounts of heat into the atmosphere. The result is lower surface pressure and strengthening winds. In this way, the tropical cyclone’s engine refuels itself, concentrating its power in a donut-shaped area, called the eye wall, surrounding the center. The eye wall typically contains the strongest surface winds. Falling surface pressure can occur only if air mass is removed from the circulation center. This is accomplished by wind flowing away from the circulation in the upper atmosphere. “Tropical cyclone” is a generic term for low pressure systems with a defined wind circulation, born over tropical, or sometimes subtropical, waters. Tropical depressions, tropical storms, hurricanes, and typhoons are all tropical cyclones. 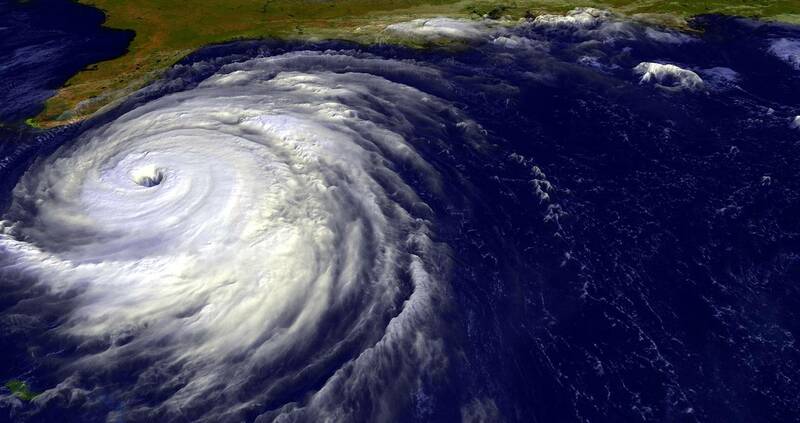 The word “hurricane” is derived from the Spanish word, huracan. In turn, the word huracan probably came from Hunraken, the Mayan storm god, or Hurakan, the Quiche god of thunder and lightning, or any of a number of other Caribbean Indian terms for evil spirits or big winds. Although the word was originally used to describe any localized tropical cyclone in the West Indies, it now classifies the powerful tropical cyclones that develop in the North Atlantic Ocean, the Gulf of Mexico, the Caribbean Sea, or the eastern North Pacific Ocean, east of the International Dateline and north of the equator. A hurricane’s life cycle passes through four distinct stages: tropical disturbance, tropical depression, tropical storm and finally, a hurricane. All are classified as tropical cyclones. A tropical disturbance is a discreet system of clouds, showers, and thunderstorms that originates in the tropics and maintains its identity for 24 hours or more. Tropical waves are a type of tropical disturbance. They are troughs of low pressure that move generally from east to west, embedded in the tropical easterlies. They are also called easterly waves. When a tropical disturbance develops a closed circulation (counterclockwise winds blowing around a center of low pressure in the Northern Hemisphere), it is designated a tropical depression. Tropical depressions contain maximum sustained one-minute winds at 10-meter elevation of 38 mph (33 knots) or less. A tropical cyclone is given a name by the National Hurricane Center once it reaches tropical storm status. Tropical storms have maximum sustained one-minute winds at 10-meter elevation of 39-73 mph (34-63 knots). Hurricanes have sustained one-minute winds at 10-meter elevation of at least 74 mph (64 knots). Winds in most hurricanes can become much stronger. Hurricanes are categorized on a scale of 1 to 5 based on their wind speed, barometric pressure, and destructive potential. This is known as the Saffir-Simpson Scale, named after its originators, Herbert Saffir and Dr. Robert Simpson. You can help people affected by disasters, such as hurricanes by donating to the American Red Cross. To make a donation, please visit www.redcross.org/charitable-donations.